As summer comes to an end, I’d like to draw your attention to a quiet middle-grade book that seems to have escaped much hype, despite being critically acclaimed. My 8-year-old daughter and I loved it as a read-aloud. The story follows Henry Hoobler over the course of his holiday before Year 3. Henry is a sensitive, mature boy who learns to face his fears about learning to ride a bike and fitting in with the older boys. It is the small scale of his adventures that make the book so endearing. The families are presented as ordinary human beings indulging in average holiday activities. They fit so much fun and happiness into their camping holiday, not just organising a World Cup Cricket match, but having a presentation ceremony where everyone is presented with a ‘slightly tattered You’ll Always Belonga at Yelonga’ cap (p 108). The language and dialogue are notable for not talking down to children. These families communicate well, politely but with plenty of passion. Mum says Oh, gosh! a lot, and Henry uses close to a hundred variations on holy moley. Refreshingly, Shanahan doesn’t shy away from using big words. So, Mr. Barone laughs maniacally as he thwarts the boys in a colossal match of epic proportions (pp 69-71). Henry’s little sister, Lulu, who still sits in a booster, calls someone incorrigible. Her mother admonishes her and she replies, ‘But he’s being very obtreperosis’. My daughter and I had a bit of a giggle at the irony of such a little girl making such ambitious mistakes. Henry scratched his nose. He didn’t think sorry was an incy-wincy word. It always felt like a word that weighed a lot. Sometimes after he had done the wrong thing and spoken it out loud, the space still ached where it used to be, in a way that was both happy and sad” (pp 74-5). Henry’s developing friendship with Cassie, who lives in the caravan park with her grandfather, is emblematic of his character development over the summer. Mum agrees that Cassie is different: plucky, brave, daring and gutsy, the type of friend who is as rare as hen’s teeth. Henry learns to come to terms with the warm slosh of happiness of this friendship, alongside the sudden rush of bruising sadness as the end of the holidays looms. 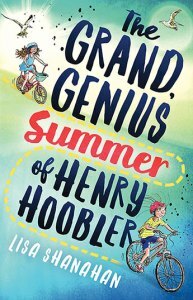 The Grand Genius Summer of Henry Hoobler deservedly won the Queensland Literary Award/Griffith University Children’s Book Award in 2017, over a strong shortlist including Wendy Orr’s Dragonfly Song and Bren MacDibble’s How to Bee.